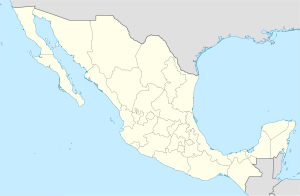 Manzanillo (Spanish pronunciation: [manθaˈniʝo]) is a city, seat of Manzanillo Municipality, in the Mexican state of Colima. The city, located on the Pacific Ocean, contains Mexico's busiest port that is responsible for handling Pacific cargo for the Mexico City area. It is the largest producing municipality for the business sector and tourism in the state of Colima. The city is known as the "sailfish capital of the world". Since 1957, it has hosted important national and international fishing competitions, such as the Dorsey Tournament, making it a very attractive fishing destination. Manzanillo has become one of the country's most important tourist resorts, and its excellent hotels and restaurants continue to meet the demands of both national and international tourism. In 1522, Gonzalo de Sandoval, under orders from conquistador Hernan Cortes, dropped anchor in the Bay of Salagua (north of Manzanillo Bay), looking for safe harbors and good shipbuilding sites. In the year before he left, Sandoval granted an audience to local Indian chieftains in a small cove, which today carries the name Playa de La Audiencia. A great part of his fleet, which left to conquer the Philippines, was constructed in Salagua. Manzanillo Bay was discovered in 1527 by navigator Alvaro de Saavedra, naming it Santiago de la Buena Esperanza, or Santiago's Bay of Good Hope. Manzanillo was the third port created by the Spanish in the Viceroyalty of New Spain. It became a departure point for important expeditions. Cortes visited the bay twice to protect his galleons from Portuguese pirates. Over the next 300 years, the Pacific Coast’s history is filled with accounts of pirates from Portugal, England, France and even Spain assaulting, looting and burning ships for their rich cargos. In 1825 the Port of Manzanillo opened, in recently independent Mexico, and so named because of the abundant groves of native Manzanilla (Hippomane mancinella) trees that were used extensively in the early days of shipbuilding. Manzanillo was raised to the status of a city on 15 June 1873. The railroad to Colima was completed in 1889. In 1908, President Porfirio Diaz designated Manzanillo as an official port of entry to Mexico. It was the state capital of Colima from 20 February to 1 March 1915, while Pancho Villa’s troops were threatening to capture the city of Colima. In the 2005 census, the city of Manzanillo had a population of 110,728 and in 2010 its municipality had 161,420. It is the second-largest community in the state, after Colima, the capital. The municipality covers an area of 1,578.4 km2 (609.42 sq mi), and includes such outlying communities as El Colomo, in addition to many smaller communities. Manzanillo is also a beach resort, and is one of many locations to promote themselves as the "sailfish capital" of the world.. One way they promote that claim is by hosting a yearly sailfish fishing tournament. The Revillagigedo Islands, off the west coast of Mexico in the Pacific Ocean, are part of the municipality, but they are directly administered by the federal government. Manzanillo is a sister city of the U.S. cities of Flagstaff, Arizona; San Pablo, California; and Saint Paul, Minnesota. 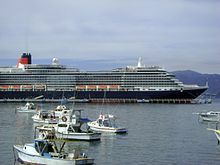 MS Queen Victoria at Manzanillo. The city is well known internationally for deep-sea fishing and the green flash phenomenon during sunsets, as well as the warm waters of the ocean. The city is a destination resort and has many hotels and self-contained resorts, particularly built on the De Santiago peninsula which juts out into the Pacific north of the city centre. Also at the north end of Manzanillo bay is the resort Las Hadas ("the fairies"), which is the most famous of the city's resorts, having been featured in the movie 10 starring Bo Derek and Dudley Moore. Beach scenes were filmed on La Audencia Bay, just over the hill from Las Hadas. Manzanillo is a popular cruise ship port of call. Many tourists go from their cruise ships on city tours. Excellent swimming, snorkeling, and scuba diving is found in Santiago Bay, a few miles north of the city where a cargo ship sank in a hurricane in 1959. Other wrecks and reefs plentiful with fish are scattered throughout the bay. Manzanillo is known as the Sailfish Capital of the World. Since 1957, it has hosted important national and international fishing competitions, such as the Dorsey Tournament, making it a very attractive fishing destination. Manzanillo consists of two bays with crescent-shaped beaches, each about 4 miles in length. Bahía de Manzanillo is closer to downtown and is the older tourist section. Bahía de Santiago, to the west, is the newer and more upscale area. The two are separated by the Santiago Peninsula. Ship channels are located at the southeast end of Bahía de Manzanillo where large cruise ships enter the port area. Manzanillo was once the scene of piracy and adventure. By 2011, its peaceful bays and sophisticated tourist and port infrastructure had made it one of the main tourist resorts and trading centers in the west of Mexico. On 6 July 2010, the Secretariat of Communications and Transportation (Secretaría de Comunicaciones y Transportes) opened a specialized dock for cruise ships at the port, which involved an investment of $100 million pesos (MXN) in the first stage. A second phase foresees the construction of a shopping centre. Manzanillo has a tropical savanna climate (Köppen climate classification Aw). The dry season, which is from November to May, has low amounts of precipitation, and temperatures tend to be cooler than in the wet season. The average temperature in March, the coolest month, is 24 °C (75 °F). The wet season, which runs from June to October, has warmer temperatures, averaging 28.3 °C (83 °F) in July, and humidity during this time is higher. In 2012, the port of Manzanillo initiated an ecological project consisting of dredged canals and creating islands in the Lagoon of the Valle de las Garzas, a protected wildlife area. With this work, the port plans to increase the flow into the lagoon, thus increasing the viability of the enhanced ecosystem that includes the planting of 15,000 mangrove trees. Extensive use of geotextile tubes (TITANTubes), manufactured by Flint Industries, was included in the channel creation. These geotextile tubes, often referred to as "geotubes" were used to create 2 parallel breakwaters on either side of the dredged channels. On Friday, 23 October 2015, Manzanillo was caught in the path of Hurricane Patricia. A Category 5 on the Saffir Simpson Hurricane wind scale, it was the most powerful cyclone ever measured in the Western Hemisphere, with sustained winds speed up to 200 mph (320 kph). Hurricane Patricia made landfall on 23 October at 7:45pm with catastrophic damage. The center of the storm hit just north of Manzanillo, saving the town from the 200 mph winds. Puerto Vallarta was also near the catastrophic damage zone. Wind and high surf created a catastrophic damage zone. Damage totaled at least $283 million. Manzanillo is the busiest port in Mexico, as measured by total tonnage and volume of containerized cargo. In 2007, the port moved 1.4 million TEUs and 18.0 million tons of total cargo. Port business experienced a significant surge during the USA's West Coast Lockout in Long Beach, California, in 2002. The port is connected by Ferromex rail lines to Guadalajara and Mexico City. Manzanillo is also home to the Navy's Pacific Naval Force. Manzanillo also hosts the most efficient port for tuna landings in Mexico. It handles exports like fish, corn, copra, lemons, bananas, canned foods, wine, lumber, and minerals. Manzanillo is well connected by Highway 200 to Colima City, to the Northwest and to Puerto Vallarta. The Playa de Oro International Airport (ZLO) is a small airport located about 35 minutes north of Manzanillo along Highway 200. The airport offers international and national flights. In addition to flights to and from the USA, the airport has international service to and from Canada. The airport is operated by "Grupo Aeroportuario del Pacifico". Ground transportation is limited to taxis and car rentals. It has daily domestic and international flights and has recently been remodeled. ^ a b c d e f g h i Manzanillo, Webmaster Go. "History Of Manzanillo Mexico". www.gomanzanillo.com. Retrieved 5 April 2018. ^ a b Manzanillo info at visitmexico.com Archived 24 August 2011 at the Wayback Machine. Ritrieved 5 August 2011. ^ "Conteo de Población y Vivienda 2005" (in Spanish). INEGI (Instituto Nacional de Estadística, Geografía e Informática). Archived from the original on 28 March 2007. ^ "Sailfish Capital of the World". www.landbigfish.com. Retrieved 5 April 2018. ^ Manzanillo info at mexico.us. Retrieved 5 August 2011. ^ "Normales climatológicas para Manzanillo, Colima" (in Spanish). Colegio de Postgraduados. Archived from the original on 21 February 2013. Retrieved 5 January 2013. ^ "Normales climatológicas 1981-2000" (PDF) (in Spanish). Comision Nacional Del Agua. Archived from the original (PDF) on 13 February 2016. Retrieved 5 January 2013. ^ "Manzanillo Climate and Weather Averages, Mexico". Weather2Travel. Retrieved 1 October 2013. ^ "Post-Tropical Cyclone Selma Public Advisory". www.nhc.noaa.gov. Retrieved 5 April 2018. ^ Sherman, Christopher (23 October 2015). "Mexico braces for strongest hurricane in Western hemisphere". Associated Press. Archived from the original on 24 October 2015. ^ "Informe Estadistico Mensual" (PDF). Coordinacion General de Puertos y Marina Mercante. December 2007. Archived from the original (PDF) on 10 September 2008. ^ "Cuales son las Ciudadades Hermanas de tu Ciudad". ^ "Se Se Hermanan las Ciudades Porturarias Manzanillo-Ninbo". Wikimedia Commons has media related to Manzanillo, Colima. Wikivoyage has a travel guide for Manzanillo.